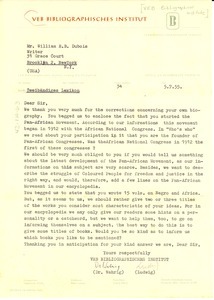 2All African Student Union of the Americas, Inc.
25 results found for: subject:"Pan-Africanism--History"
Leipzig (Germany) - Signed Dr. Wahrig and Ludwig; requesting that he provide detailed information on the founding of the Pan-African movement, and on his own publication history and notes on "the works you consider most characteristic of your ideas," for inclusion in the Zweibändiges Lexikon." 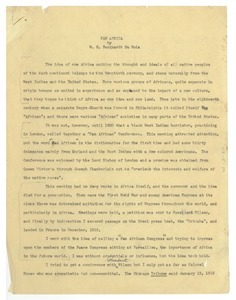 A description of the history and present status of the Pan-African Movement, published in "Colonial and Colored Unity: A Programme of Action: History of the Pan African Congress," edited by George Padmore. See also mums312-b229-i066, i067, i068. 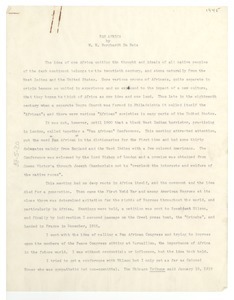 A description of the history and present status of the Pan-African Movement, published in "Colonial and Colored Unity: A Programme of Action: History of the Pan African Congress," edited by George Padmore. See also mums312-b229-i067. 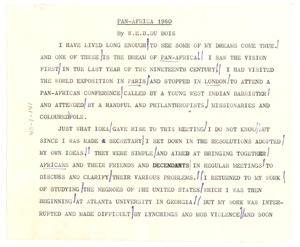 A description of the history and present status of the Pan-African Movement, published in "Colonial and Colored Unity: A Programme of Action: History of the Pan African Congress," edited by George Padmore. See also mums312-b229-i066, i067, i069. 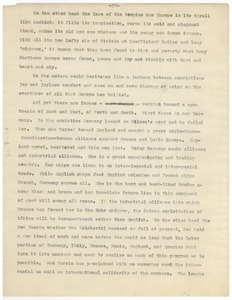 Fragments of the latter portion of an article about new developments in the Pan-African movement. 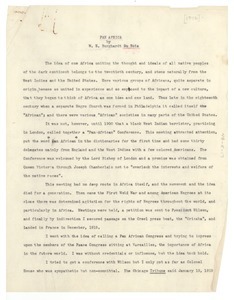 A description of the history and present status of the Pan-African Movement, published in "Colonial and Colored Unity: A Programme of Action: History of the Pan African Congress," edited by George Padmore. Presumably the final draft. See also mums312-b229-i066, i068, i069. Ypsilanti (Mich.) - Lamenting but appreciating the scope and institutional affiliation of Du Bois's projected writings on the Pan African Movement (noted in mums312-b151-i282) and defending Columbia University's support of "the African cause" (as attacked therein). 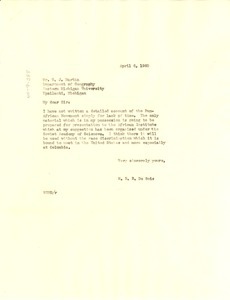 New York (N.Y.) - Per his query (mums312-b151-i280), explaining that "lack of time" has prevented him from writing a thorough study on the Pan African Movement and noting that the work he has prepared thereon shall soon be presented at the Soviet Academy of Sciences, where it will not fall prey to the discrimination "which it is bound to meet .... at Columbia [University]." 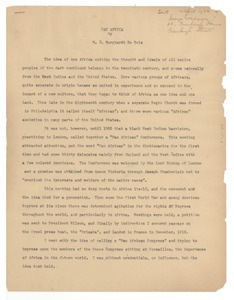 Africa - In this speech Du Bois gives a history of his involvement in the Pan-African movement from its inception through the birth of independent African nations. 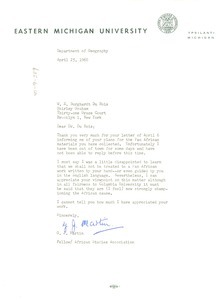 He recommends to the burgeoning African nations a program of cooperation toward the creation of a united African nation with a socialist government. 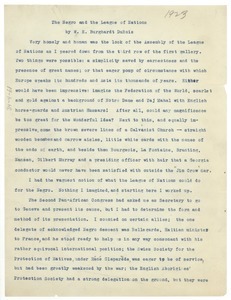 Draft of an article reporting on the opening of the League of Nations which Du Bois attended as a representative of the Pan African movement.